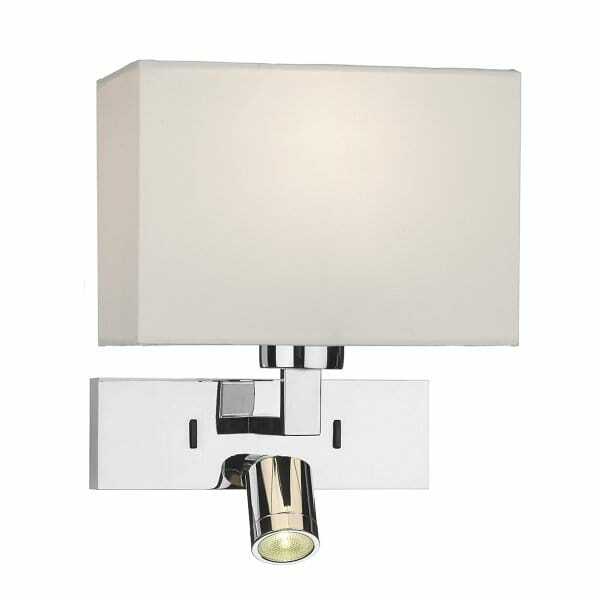 Hotel style wall light MODENA LED chrome rectangle light with ivory rectangle shade. The Lighting Book Hotel style wall light MODENA LED chrome rectangle light with ivory rectangle shade. Create a sophisticated modern bedroom with hotel style bedside lights. The modern chrome wall light complete with cotton ivory shade has an additional LED reading light it’s is both elegant and practical. A bedside wall light frees up space on the bedside table. It is switched to so there's no need to get out of bed to switch off the lights. Here at The Lighting Company we have a large and ever growing range of lighting to suit every setting. Browse the full range of modern wall lights here: Modern Wall Lights.